I didn't just collect baseball cards as a kid. I collected Star Wars, Mork & Mindy, Kiss, The Bee Gee's Sgt. 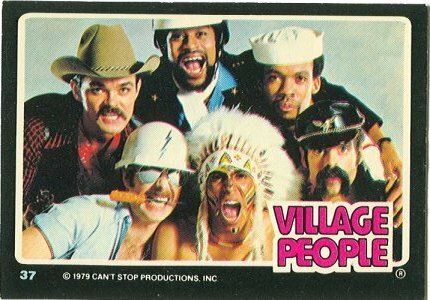 Pepper, and Incredible Hulk cards...... but Village People cards? Something is very, very wrong about this. I'm not going to sit here an lie and tell you I didn't like the Village People. I did.... and still kinda do. 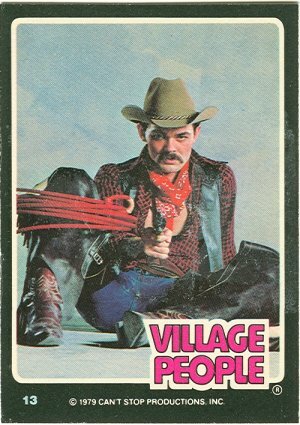 Nothing against them - it just strikes me as insanely funny to picture 70s kids swapping Village People cards. What's perhaps even stranger is I didn't know they were gay. Sure, I was a young lad, but with this level of gayness, there's no excuse I mean, they made Frankie Goes to Hollywood look straight. Would you look at this cowboy? He's as gay as a picnic basket, and yet I was totally oblvious. "Hey Jimmy, I'll trade you my Steve Garvey rookie card for your gay biker card." "Deal! I'll trade you a Vida Blue all star card for your amazingly gay cowboy." If you need more proof that they are gay, watch the cult classic You can't Stop the Music, starring Bruce Jenner and Steve Guttenburg. My brother had some Happy Days trading cards that he got from flipping card with his friends- I think that's something that kids used to do- I don't trust my memory. Wow, I collected all kinds of cards also, but never even knew about these! I didn't know they were gay either. I think I was in my late 20s (late 1980s) when I found out Queen was gay. Of course by then it wasn't really a shock. Seriously...you didn't know they were gay? Okay, I do seem to remember the guy who played the cop saying at one point he wasn't gay. Then of course he went and did something that got him arrested after he quit the group. He should have stayed with the gay boys. It was safer. Seriously...you never wondered about the Indian? Not even a little? You really missed out on how incredibly funny and skanky, but somehow clean, they were. Okay, I think you should sit down for this but...Milli Vanilli were gay and didn't sing. I'm just sayin'. Tattered & Lost- I've known they were gay for 20 yrs or so; I guess I should've been clear. I didn't know they were gay at the time, while they were popular..... I think I might reword the post a little. No, no...I understand. If I'd been a kid I'd have just thought they were really colorful fellas. I would have never gotten the joke. But you have to understand I learned what a prostitute was by watching Perry Mason in the early '60s. American middle-brow culture has shaped my world too. I recall Sgt. Pepper's Lonely Heart Club Band (Movie) cards. Yes, I had the set. I sort of hate 1979. Summer '78. The VP are all over the radio with YMCA and (hoo boy) IN THE NAVY. Apparently (wait for it... ) they were not all gay. Just the Indian. Read it in Mojo magazine several years ago. Cynical marketing ploy!